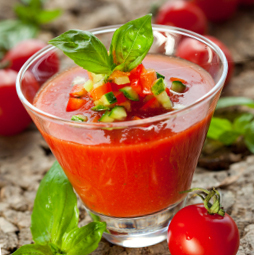 Chilled soup is one of the best ways to add more detox foods in your diet. Chilled soups are full of healthy raw vegetables, are easy to prepare and offers a refreshing change for summer lunches. Rich in antioxidants and in enzymes, those delicious soups will help your body to detox naturally. Working in two batches, blend all the ingredients except the basil leaves in a blender for two minutes or longer until smooth and frothy. Transfer to a bowl or container and chill for at least two hours before eating. Garnish each bowl or glass with silvered basil leaves. 2. Working in batches, purée the vegetables and herbs in a blender with the broth and more olive oil for two minutes until frothy and smooth. Pour into a bowl, and stir to combine. Taste and adjust seasonings. Chill for several hours. 3. Serve, garnishing with more chives, tarragon and/or mint. Purée mangoes, orange juice and oil in a blender or food processor until smooth. Transfer to a medium bowl, along with remaining ingredients. Season with salt and pepper to taste. Chill for several hours before serving. Garnish with chopped fresh cilantro, red onion and seedless jalapeño. Working in batches, purée all the ingredients except the garnish in a blender for two minutes or longer until frothy and smooth. Taste and adjust seasonings, making sure you have used enough salt and lemon juice for a vivid flavor. Transfer to a bowl, and chill for several hours. Taste and adjust seasonings. Serve, garnishing each bowl with thinly sliced celery or, if serving in glasses, with a thin lengthwise slice of celery stick. Working in batches, purée the beetroot, cucumber and jalapeño with 1.5 litres of cold water in a blender until smooth. Pass through a fine strainer into a large jug, then stir in the vinegar and season generously. Chill for several hours before serving. Garnish with fresh chopped parsley. 1. Peel the avocados and place in a blender container with lemon balm, lime zest, lime juice and ½ cup milk and blend until smooth; season to taste with salt and pepper and adjust the consistency with the remaining milk. 2. Strain the soup through a fine mesh sieve. Serve in chilled soup bowls garnished with radishes, chives, olive oil and a squeeze of lime juice.